We ended up with a pretty nice February day since the weather forecast called for rain and cold. It was cold, but we ended up having some sunshine that helped warm the air a bit if you were in the sun. 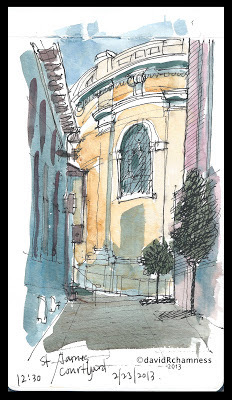 I started off sketching before the meet up time in the small alley way coming off Terry St. 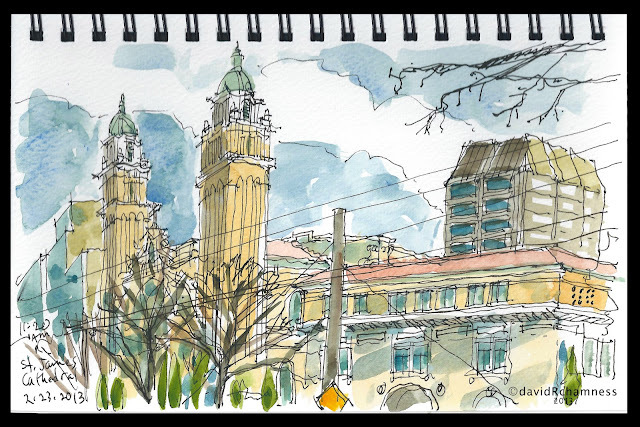 This second sketch was done from across the street sitting on an exhaust vent grill of a multi-family apartment building. The warm air kept me from getting too cold and helped the water colors dry more quickly. Hopefully no nasty exhaust fumes! Finally inside the cathedral, I perched in the back of the south transept, so that I could look across the crossing to the north transept and the oculus above. Since there is so much going on in the ceiling, I decided to quickly capture a sense of the space. I was very loose and free on this sketch. Didn't spend too much time thinking, just moving quickly with pen and color. 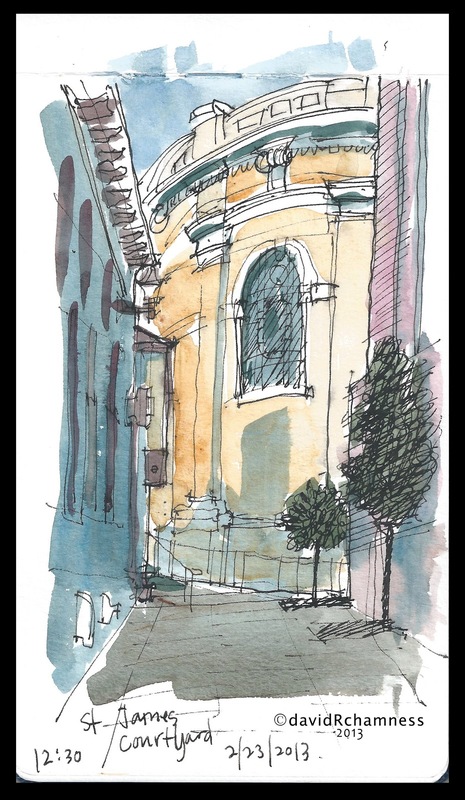 I missed most of the sharing time because I squeezed in one more sketch sitting on the sidewalk of Columbia St. looking up the alley. 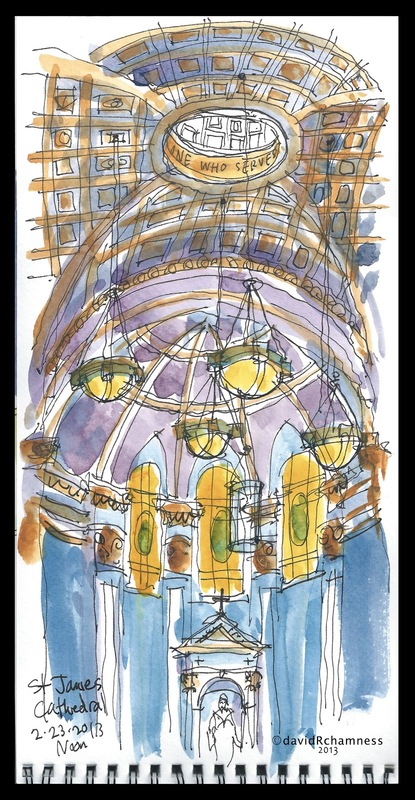 The focus of the sketch is the outside of the south transept and one of the three stain glass windows. I enjoyed this one the most because it was about the space between the buildings. I went into the Frye Art Museum and had a sandwich at the cafe with some other sketchers. 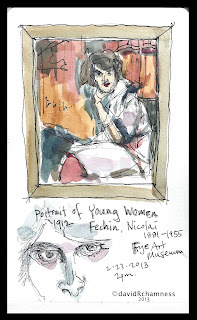 I decided before leaving to check out the current exhibit of the Russian painter Nicolai Fechin. 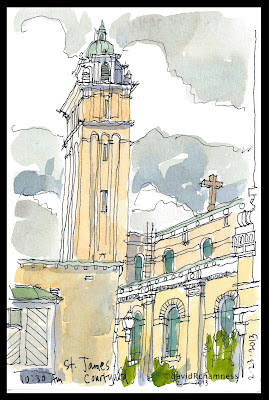 Wonderful landscapes, sketches and portraits. This one of a young women caught my eye, literally! (added color in my car outside the museum) Worth a return visit soon. Great sketches... The twin towers are beautifully done. I agree, excellent sketches. You were very prolific today. So lovely, David. Wish I could have been there. You captured the spirit of the cathedral from every angle. They are loose colorful and lively.we need to start our weekly sketching again so I can learn from you! !